If you’re seeking crochet inspiration, might I remind you that Easter is coming up and I have a free crochet pattern for easter eggs, chicks and bunnies? A reader recently sent me a pic of one of the eggs she made– she lined the bottom with fabric and turned it into a pin cushion– what a great idea! Craft zine also recently republished my wildly popular Crocheted Reversible Swiffer Sock pattern in an easy-to-print format. And if you still haven’t gotten your hands on Crochet Adorned (which was nominated for a Flamie! ), Blue Bird Luxe is giving away a free copy on her blog! 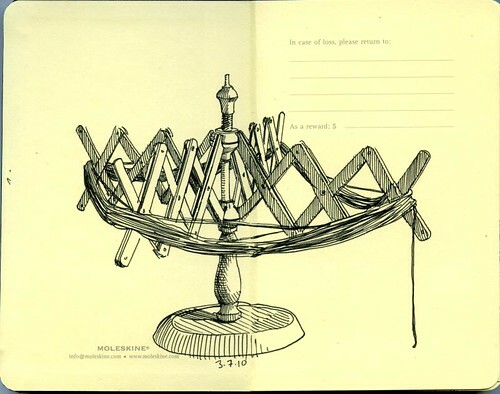 The drawing above is by Paul Heaston–it’s my yarn swift. Love your Moleskine. You have the same exact swift that I do!